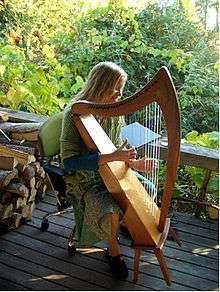 The Celtic harp is a triangular harp traditional to Brittany, Ireland, Scotland and Wales. It is known as a telenn in Breton, cláirseach in Irish, clàrsach in Scottish Gaelic and telyn in Welsh. In Ireland and Scotland, it was a wire-strung instrument requiring great skill and long practice to play, and was associated with the Gaelic ruling class. 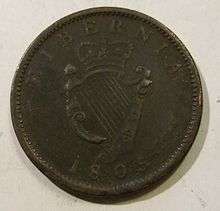 In the Republic of Ireland, it appears on the coins and coat of arms. 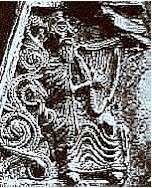 Early images of the clàrsach are not common in Scottish iconography, but a gravestone at Kiells, in Argyllshire, dating from about 1500, shows one with a typically large soundbox, decorated with Gaelic designs. ↑ John Bannerman, ‘The Clàrsach and the Clàsair’ in Scottish Studies 30, 1991, pp.3-4. 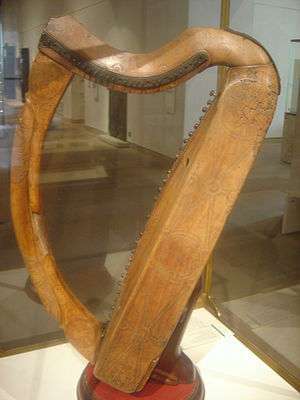 ↑ – the fourth is the 15th century 'Wartburg' harp from Germany. ↑ Rimmer 1980, p. 35. ↑ "old harps". Early Gaelic Harp Info. Retrieved 2013-10-09. ↑ Dimock 1867 (ed. ), pp. 154-5: Multorum autem opinione, hodie Scotia non tantum magistram aequiparavit Hiberniam, verum etiam in musica peritia longe praevalet et praecellit. Unde et ibi quasi fontem artis jam requirunt. ↑ Budgey 2002, p. 209. ↑ Rimmer 1980, pp. 35-37. ↑ Rimmer 1969, p. 34. ↑ Rimmer 1969, p. 54. ↑ Dwelly 1901-11, 1977, p. 206: clàrsach . ↑ "Irish Terms". Early Gaelic Harp Info. 2002-10-21. Retrieved 2013-10-09. ↑ Watson 1934, 46 – Crònan an Taibh. ↑ Watson 1934: 62 – An Crònan. 1 2 Newton & Cheape, pp. 77-78. 1 2 Keith Sanger, ‘Final Chords—the Last Scottish Harpers’; WireStrungHarp. ↑ Rimmer 1980. p. 67. ↑ "Ann Heymann | Portland Clarsach". Pdxclarsach.wordpress.com. Retrieved 2013-10-09. Watson, J. Carmichael (ed.) (1934). Gaelic Songs of Mary MacLeod. Blackie & Son Limited: https://archive.org/stream/gaelicsongsofmar00macl/gaelicsongsofmar00macl_djvu.txt.